A 2013 BBC poll found 87% of Americans view Iranian influence negatively, which is odd because few Americans ever met an Iranian. What caused the negativity? Our relations with what was Persia used to be positive. We established diplomatic relations in 1883 when Persia, like many other nations, was threatened by British and Russian colonizing although there was little contact between us until 1906 when Persia established a constitutional monarchy. The Shah was forced to accept an elected parliament. The Qatar royal family had borrowed massively from Britain and Russia, ruining the country’s finances, so Persia’s new parliament appointed an American, Shuster, as Treasurer General to set things straight. But Britain and Russia continued to dominate Persia and its neighbors. Following their formal agreement about which of them would control which parts of Persia, Afghanistan and Tibet, they pressured Persia in 1911 to expel Shuster. In 1921 when the treasury was empty again, another American, Millspaugh, was hired to straighten things out. He freed the country from foreign loans by 1927 and Persians came to see the US as their liberator from Britain and Russia. In 1925, Reza Shah deposed the last Qajar Shah and founded the secular Pahlavi dynasty. He introduced reforms that modernized the nation he renamed Iran, but he was a despot. He was forced to abdicate in 1941 at the time of a WW2 Anglo-Soviet invasion. In 1942, Millspaugh was invited back by Iran’s parliament but he was forced out in 1945 by Reza Shah’s son, Mohammad Reza Pahlavi, because he kept refusing to increase military spending. In 1953, the government was overthrown in a coup orchestrated by the CIA and the British MI6 after Iran’s elected leader tried to nationalize its oil industry, 80% of the profits of which were going to Britain. Mohammad Reza Pahlavi was reinstated as a close US ally. During the Cold War, we supported Iran’s and many other unpopular and repressive regimes as bulwarks against the Soviet Union. In 1979 when widespread unrest forced the Shah to flee, Ayatollah Khomeini returned from exile and established an anti-American, radical Islamic regime. Iranian students, angry when the Shah was admitted to the US, stormed our Embassy and held hostages. That was the end of secular Iran and friendly relations with the US. We made a failed attempt to rescue the hostages in 1980, they were released immediately Reagan replaced Carter, then things got murky. Iraq hoped to take advantage of the chaos in Iran and attacked without warning in 1980. Saudi Arabia and Kuwait, fearing the Iranian revolution could spread, provided support. Saudi Arabia is thought to have provided $1B/month. Support also came from France, Germany, the Soviet Union and the US, including intelligence on Iranian deployments from our satellites and radar planes. President Reagan said we would “do whatever is necessary to prevent Iraq from losing the war with Iran.” We sold poisons for chemical weapons Iraq used against Iran and its own Kurds. The war ended in stalemate in 1988 with perhaps half a million Iraqi and Iranian soldiers and as many civilians killed. In 1985 while we overtly supported Iraq, we also secretly sent weapons to Iran in exchange for help freeing US hostages in Lebanon. We illegally sent the profits to anti-Communist rebels in Nicaragua and when that became public in 1986, President Reagan suffered a short-lived political crisis. In 1988, we shot down an Iranian commercial flight over the Persian Gulf, killing 290 Iranians, most of whom were on their way to Mecca. When the war ended, Iraq could not repay the $14B it borrowed from Kuwait and asked that the debt be forgiven, saying they had prevented Iran from over-running Kuwait. Kuwait did not agree. In 1990 Iraq accused Kuwait of stealing Iraqi oil by slant drilling, then invaded and announced that Kuwait was now part of Iraq. US-led forces drove Iraq out early in 1991. That was when Iraq ceased to be our ally. In 1993 we adopted a new “dual containment” policy that aimed to end the regional ambitions of both Iran and Iraq. Iran elected a reformist president in 1997 but in his 2002 State of the Union address, President Bush named Iran part of an “axis of Evil” and said Iran is trying to build nuclear weapons. Then in 2005, Iran elected a conservative president. He called for Israel to be wiped off the map, and Iran resumed uranium conversion. US Secretary of State Rice termed Iran an “Outpost of Tyranny” along with Cuba, Burma, North Korea, Belarus, and Zimbabwe. But in 2006, Iran’s president wrote to President Bush calling for dialog. We made no direct response but agreed to join European nations in talks with Iran if Iran suspended uranium enrichment. In 2007, for the first time in 27 years, officials of Iran and the United States met face-to-face. In December 2007, a U.S. National Intelligence Estimate said Iran had ended its nuclear weapons program in 2003. But nonetheless, the UN ratified four rounds of sanctions on Iran between 2006 and 2010 and the US and EU also imposed sanctions, including on its financial sector in 2012. The US Treasury claims Iran’s currency lost two-thirds of its value in the next two years. Is that what really motivates our government? What really motivates us, then, is that nuclear weapons would prevent us from attacking Iran. It’s quite a stretch to claim Iran is an existential threat to us. Our media portrays Iran’s leader (whoever he may be at the time) as a new Hitler who will stop at nothing to dominate the world. But that’s nonsense. Iran will not commit suicide by using a nuclear weapon against us or Israel. We both have huge nuclear stockpiles. Positioning Iran in that way tells them they would be fools not to acquire nuclear weapons. The dictators who gave up that quest, Saddam Hussein and Muammar Gaddafi, provide the lesson. It is rational for Iran to want nuclear weapons. We toppled their democratically elected government and installed a despotic ruler in 1953, we backed Iraq’s war against them from 1982-8, President Bush threatened a military strike, Israel often does, we’ve imposed the harshest ever sanctions, and they see what we’ve done to their neighbors, Iraq and Afghanistan. Equally, it is not irrational for Iran to back Hezbollah’s battle against an Israel that keeps threatening military action. A deal to end that support would be good for us as well as Israel because Hezbollah is a far more capable terrorist group than al Qaeda ever was. It is true that Iran has a terrible human rights record. In 2013 it ranked 167 in the world, according to the International Human Rights Indicator. But we don’t care about our allies’ human rights: think Mubarak, Gaddafi, and for many years, Saddam Hussein. What we care about is compliance with our foreign policy. Egyptian dictator Mubarak was OK with Israeli military action in Lebanon and occupied Palestinian territories. Gaddafi became our friend until he spoke of nationalizing Libya’s oil. We supported Iraq’s war on Iran then made war on Iraq, threatened Syria, are making drone attacks in other Middle East nations, and now we say the “Islamic State” is the enemy. But if we really do want to destroy the Islamic State, we need Iran as a partner because air strikes won’t be enough. And more importantly, the power vacuum that allowed the Islamic State to flourish must be resolved unless we want perpetual instability in the Middle East. There must be a political solution, which means we must talk with Iran not just because of their concerns but because they influence Shia leaders in Syria and Iraq. Our leaders fear an Iran with nuclear weapons that would neuter their freedom to attack. But what makes we the people fear Iran? What is our underlying fear? Iran jailed Pastor Saeed for “undermining national security.” His Christian missionary work did not threaten territorial security. He was working against the religion on which Iran’s laws are based. We, just as the colonial powers did, send missionaries to “foreign lands” to replace their beliefs with our own. The poster’s publisher, ACLJ.org, is an arm of Christian Advocates Serving Evangelism, Inc. Christian evangelism tends to suggests we aim to make the whole world American. Iran’s leaders may also wonder if temporal victory really is our aim. President Reagan believed in the Rapture, when all true believers will be taken into heaven and all others will face tribulation. On at least eleven occasions he said the end of the world is coming, maybe soon. President Bush had similar beliefs but, since the Cold War was over, he saw the Antichrist not in Russia but the Middle East. Still though, why would so many Americans want no deal to stop Iran getting nuclear weapons? 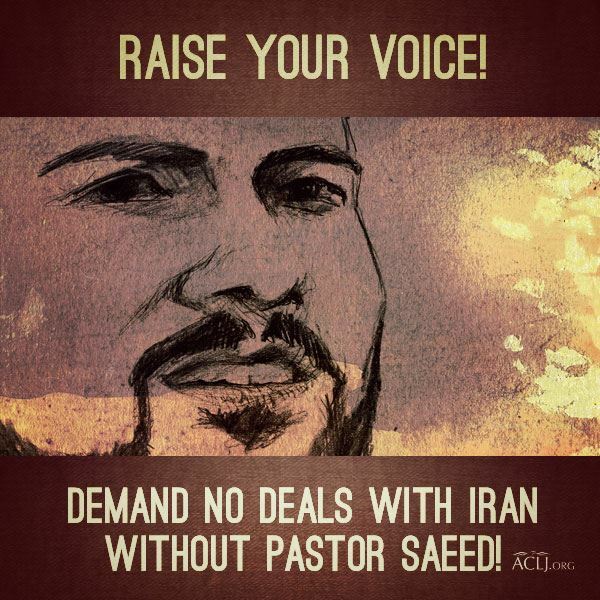 How could the pastor’s release from jail be more important than nuclear proliferation in the Middle East? Because humans are programmed to fear “the other.” Some small group becomes noticeable, we don’t know any of them personally, we don’t know much about them, they seem different from us, we imagine they are all the same and rapidly growing in number, then we feel threatened. Jews have been “the other” in many societies throughout history. Roman Catholics were “the other” here when Kennedy was running for President. More recently Muslims have become “the other” here and in Europe. Now we imagine all Muslims are the same, and because the ones we’re shown by the media are terrorists, we imagine all Muslims to be potential if not yet actual terrorists.